Democracy Spring Sit-In Protest Brings Hundreds To Capitol Steps : The Two-Way The Democracy Spring coalition of progressive groups called on legislators to replace caps on campaign donations, fix the Voting Rights Act and end gerrymandering. At least 400 were arrested. Protesters with a coalition of progressive groups sit in front of the U.S. Capitol steps Monday as part of the Democracy Spring demonstration. 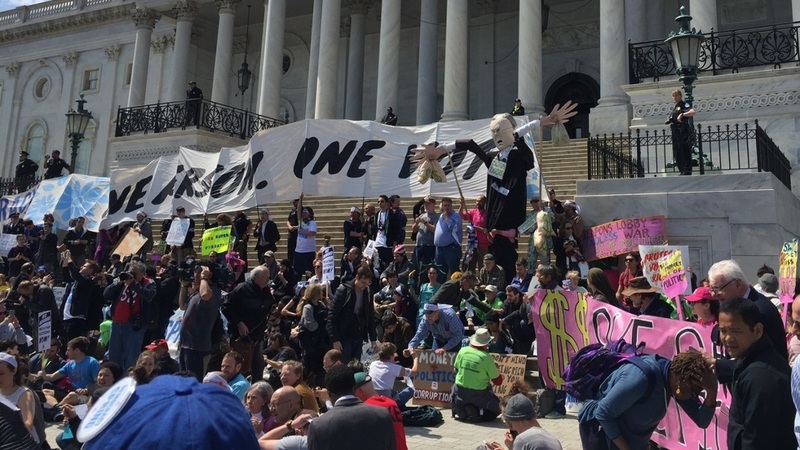 Police needed most of Monday afternoon to arrest all of the sit-down protesters outside the U.S. Capitol in Washington at a demonstration in favor of changing the rules on political money, voting rights and redistricting. 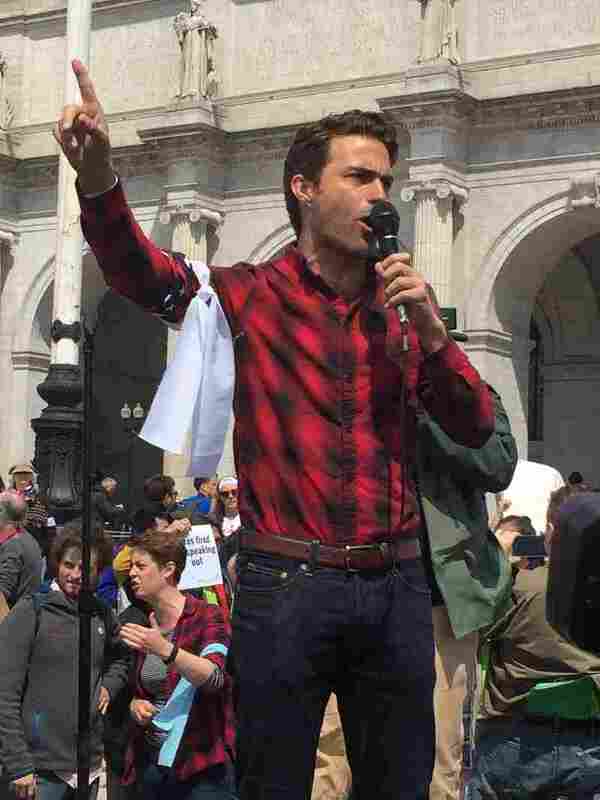 More than 600 turned out for the protest, and more than 400 were arrested in closethe sit-in at the Capitol steps, U.S. Capitol Police reported. The nonviolent protest was led by Democracy Spring, a coalition of more than 100 progressive groups. The protest was cheery and peaceful. Police blockaded the marble staircase with a chain and a cordon of officers. Demonstrators sat in front of the chain and on the plaza, talking, chanting, singing and taking pictures as police led them away one by one. Police, badly underestimating the potential crowd, initially brought a single bus to Capitol Plaza to haul the protesters away. Kai Newkirk with the group 99Rise speaks ahead of the Democracy Spring sit-in Monday in Washington. In a rally preceding the protest, organizer Kai Newkirk of the group 99Rise told the crowd that "we send a message — to everyone in our country who needs a government that represents us all — that this House is your House too, and now is the time to stand up and to take it back." The coalition wants a "Congress of Conscience" to pass legislation limiting undisclosed and big-donor money, giving more clout to small donors; to restore powers in the Voting Rights Act; and to put an end to gerrymandered districts that insulate incumbent lawmakers from election challenges. Newkirk has been campaigning to limit political money since 2014, when he interrupted a Supreme Court hearing to object to rulings that lifted restrictions on big donors. Democracy Spring plans four more daily protests this week. April 16-18 it will be joined by another large coalition, Democracy Awakening, for a teach-in, speeches and another sit-down demonstration.